This article is about the central suburb. For the entire urban area, see Rockhampton. For the former local government area, see City of Rockhampton. Rockhampton City is the central suburb of Rockhampton in the Rockhampton Region, Queensland, Australia. It is informally known as Rockhampton central business district (CBD). 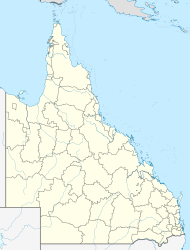 Rockhampton City is a roughly rectangular suburb, bounded by the Fitzroy River to the north-east, North Street to the north-west, Murray Street to the south-west and South Street to the south-east. It is rectangular ahead from the area excised for the Rockhampton railway station which interrupts the boundary on South Street. Rockhampton City is home to many regional offices of various government organisations as well as many private companies, serving as a hub for Central Queensland. There has been extensive construction in the city centre over the last 10 years, in 2015 its estimated population was 3553. Rockhampton CBD is home to the East Street Mall. The East Street Mall spans one city block and consists of around 40 shops including food, fashion, shoes, home wares, chemists and banks. The East Street Mall underwent a million dollar redevelopment in 2003 as part of the CBD beautification, it included the return of vehicular traffic to the Mall. The CBD also features Rockhampton's beautiful Riverbank Parklands. The Riverbank Parklands were constructed in 1998 and are home to the Twilight Markets and Twilight Movies which are held at the start of every month. A multimillion-dollar riverbank redevelopment plan was released in 2015 with construction starting in September. The plan includes a zero depth water play area, improved boardwalks and seating areas, Cafes and jetty's all overlooking Mount Archer, Quay street between Derby and Fitzroy street will become a shared space for vehicles and pedestrians. The redevelopment should be completed in mid 2016 for the Rockhampton River Festival. The beautiful heritage buildings features 26 buildings of historical significance in three blocks of Quay Street and East Street. Rockhampton's major southside shopping centre, City Centre Plaza, is located in the CBD on Bolsover Street. The shopping centre features Coles and Target and 36 speciality shops and above and underground car parking. The Hall State School opened 17 January 1910. The school opened as The Hall Girls and Infants School. It amalgamated with Leichhardt Ward. Over the past years the CBD has seen many major developments. In 2009 'The Edge' opened as the Tallest building in Central Queensland, being 12 stories high. In 2014 'Empire' was topped out at 14 stories being several meters taller than The Edge. The $65 million development includes about 150 rooms, 5 star hotel lobby and reception, 3 ground level restaurants and 2 levels of under ground parking. Many low rise apartments have also been constructed along Victoria Parade ranging from 5 - 11 floors. Another 10 story development, Gallary Apartments is set to start in early 2016, it will include an alfresco dining ground level cafe. Rockhampton Art Gallery in Rockhampton City is home to one of the seven Big Bulls statues that decorate Rockhampton, which regards itself as the Beef Capital of Australia. Unliike the other bull statues which are intended as realistic depiction of different breeds of cattle, the "Under the Hammer" statue was created as an artwork. The Big Bulls are listed as one of Australia's big things. ^ Australian Bureau of Statistics (31 October 2012). "Rockhampton City (State Suburb)". 2011 Census QuickStats. Retrieved 17 February 2017. ^ "Rockhampton City - suburb in Rockhampton Region (entry 49354)". Queensland Place Names. Queensland Government. Retrieved 6 August 2017. ^ Gately, Michelle (8 August 2015). "Rockhampton riverbank plans make an impression". Rockhampton Morning Bulletin. Retrieved 26 July 2017. ^ "Opening and Closing dates of Queensland Schools". Department of Education and Trading Queensland. Queensland Government. 1 August 2013. Retrieved 31 January 2018. ^ "Rockhampton's Empire continues to grow every day above city". Rockhampton Morning Bulletin. 14 March 2014. Retrieved 26 July 2017. ^ Plane, Melanie (27 July 2015). "Work on Gallery Apartments on riverfront begins early 2016". Rockhampton Morning Bulletin. Retrieved 26 July 2017. ^ "Where's the Beef?". Rockhampton Art Gallery. Archived from the original on 5 August 2017. Retrieved 5 August 2017. ^ Robinson, Paul; Farrow-Smith, Elloise; Saunders, Miranda (17 April 2014). "An ownership row has erupted over who holds Australia's Beef Capital title". ABC News. Australian Broadcasting Corporation. Archived from the original on 5 August 2017. Retrieved 5 August 2017. ^ Clark, David (2004). Big Things: Australia's Amazing Roadside Attractions. Penguin Books. pp. 10–13. ISBN 0-14-300200-7. This page was last edited on 19 June 2018, at 18:56 (UTC).